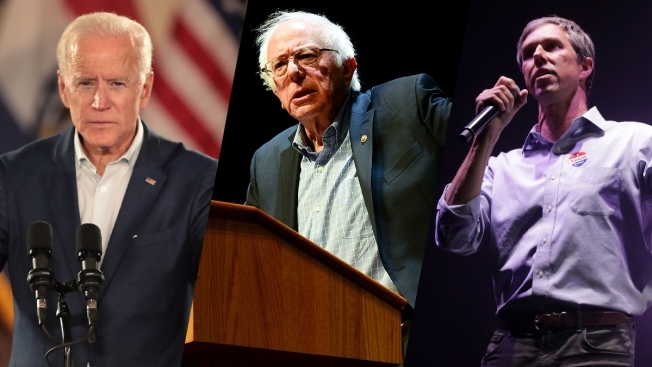 From left: Potential Democratic presidential contenders former Vice President Joe Biden, Sen. Bernie Sanders of Vermont and Rep. Beto O'Rourke of Texas. Heavyweight contenders for the Democratic presidential nomination in 2020 are looking for office space and on-the-ground staff in Iowa and New Hampshire, key early contest states, NBC News reported. But no major candidate has definitively signaled plans to jump run for the nomination — including the so-called "three Bs" topping some early polls, who have been all but absent in both states: former Vice President Joe Biden, Sen. Bernie Sanders of Vermont and Rep. Beto O'Rourke of Texas. While operatives in Iowa and New Hampshire expect activity to ramp up in January, there's been surprise at the slow start in states where presidential politics can be a full-time occupation. "The whole field has been in a staring contest to see who moves first. And there's a real hesitation for anyone sign on with a candidate now, because you don't know who else is going to get in," said Sean Bagniewski, chairman of Iowa's Polk County Democrats. Click here to see necn's New Hampshire candidate tracker.